Apple in June introduced new 10.5 and 12.9-inch iPad Pro models with new features like a faster processor and an improved ProMotion display with a 120Hz refresh rate, and it appears these new tablets are appealing to consumers. Apple sold over 11.4 million iPads during the third quarter of 2017, according to today's earnings results, bringing in nearly $5 billion in revenue for the company. That's up 15 percent from the third quarter of 2016, where Apple sold just under 10 million iPads. Compared to the second quarter of 2017, iPad sales are up an impressive 28 percent, indeed suggesting the new iPad Pro models have been a hit. Apple also released a low-cost revamped "iPad" earlier this year, and its $329 price tag combined with a speedy A9 processor may also be driving iPad sales. iPad sales may climb even higher next quarter as the new iPad Pro models were introduced towards the end of the third quarter in June. At 11.4 million iPads sold, Apple far exceeded analyst expectations. Many analysts forecasted a decline in sales, predicting Apple would sell only 7 to 9.8 million iPads during the quarter. Prior to mid-2016, Apple saw a 10 quarter decline in iPad revenue, but numbers have climbed since the introduction of the iPad Pro and Apple's effort to position it as a full PC replacement. Perfect products, perfect pricing structure, a software gap that is all but impossible to close for competitors. It's time for Tim Cook's naysayers to eat a giant humble pie.. The 9.7" iPad released in late March has a huge impact on these improved sales numbers too, perhaps even more so than the new iPad Pros. I'm one of those new iPad owners. The new 10.5 iPad Pro with iOS 11 sold me. I've owned an iPad in the past (3 years ago) ... but I ended up selling it because it didn't really keep me using it on a daily basis. This new 10.5 has been my new go-to device. I use it more than my iPhone and MacBook Air now. "Rumors of my death have been greatly exaggerated"
Good to hear the new iPad low/high strategy is working. The old strategy of iPad mini 3, mini 4, and Air 2 was killing sales performance quarter after quarter. Well, no. The old strategy of adding Touch ID to the mini 3 and calling it a 4, adding a chip to the Air and calling it and Air 2 was killing sales. Most people are not going to spend hundreds of $ to update to essentially the same device. This year's crop of iPads is really the first "all new" line up since the Air and Mini 2. The mini 4 received big upgrades: laminated display, increased color gamut, thinner chassis, A8, 2GB RAM. Consumers responded negatively and it did nothing except continue the slide in iPad sales. The Air 2 was overpriced for what it offered. 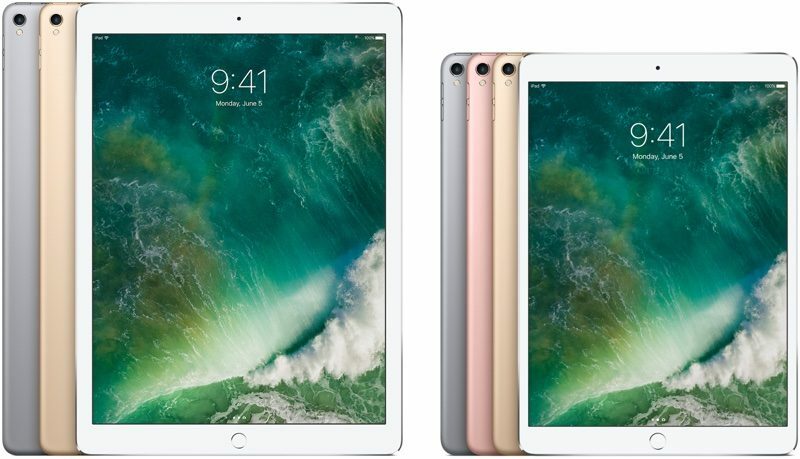 The 2017 iPad ($329) isn't all new except for the price. I think it's pretty clear consumers are responding positively to the low price and 9.7" display. I don’t know what you guys are talking about. The Air 2 was an absolute beast of a tablet and it wasn’t really expensive considering the specs at that time. iPad 2, Air 2, and the new 10.5 iPad Pro are among the best Apple has offered in the tablet market. Apple finally makes an iPad and operating system that is worthy of using more often than a laptop, and suddenly sales are up...who would have thunk it?!? Love my 10.5, smart keyboard, and iOS11! Not surprised to hear this. The 10.5" is a fantastic device, they've got it just right. The screen size is perfect, the device is incredibly powerful, the pencil is amazing, and iOS is starting to offer enough features that it can replace a laptop for many use cases. I didn't think I'd ever bother with an iPad again until it came out, so consider me a converted skeptic! I'm glad I contributed to the turn around in iPad sales.